Amy received her Bachelor's degree in Communication Disorders from the University of Kentucky and her Master's Degree in Speech-Language Pathology from the University of Redlands. She has been a speech-language pathologist since 2004, working with toddlers through young adults. She has worked in a wide range of settings, including in-home early intervention, early childhood special education, elementary self-contained programs, pediatric rehabilitation units, university clinic, and private practice. She has developed AAC evaluation teams at several sites. 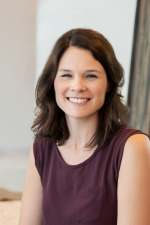 Prior to relocating to Virginia in 2015, Amy was a full-time Clinical Assistant Professor in the speech-language pathology graduate program at Northern Illinois University. Currently, she is a full-time SLP at a LAMP Center of Excellence in Northern Virginia. Amy specializes in Augmentative/Alternative Communication (AAC) and working with children who exhibit complex communication needs. She has worked extensively with occupational therapists and other related professionals to best understand and treat children with sensory processing disorder, visual impairments, and motor impairments. She works closely with families to educate, train, and support implementation of AAC in the home environment, and has led support groups for parents of AAC users. She also collaborates with and trains school teams in regards to language development and implementation of AAC in the educational setting. She has experience presenting locally and regionally to SLPs, teachers and assistants, occupational therapists, and other assistive technology professionals. She also co-developed and taught a graduate course on AAC, and has guest lectured in undergraduate and graduate level courses on numerous occasions. Amy is an active member of the American Speech Language Hearing Association (ASHA). Financial: Amy Bereiter is contracted by The Center for AAC and Autism. Non-Financial: Amy Bereiter is a member of the American Speech Language Hearing Association (ASHA). Amy receives free equipment from the Center for AAC and Autism to use for her presentations.